Thread: How do I lock & hide a handgun on motorcycle? Not sure if it would work on your bike or not. I would think the stronger the connection of the safe to the frame of the bike the better. The real key is not letting on that there's a gun out there. 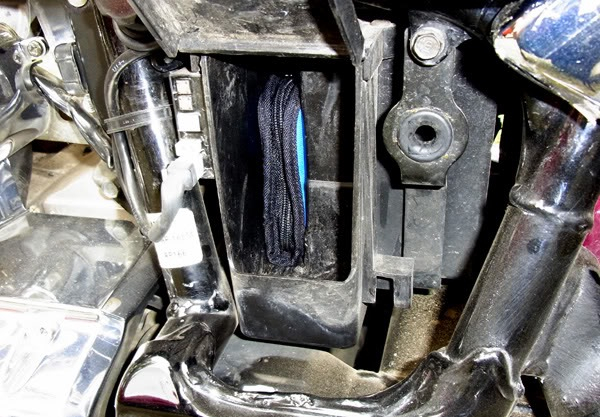 Your wish for a mountable holster, etc would likely be best addressed as a custom installation specific to your bike, available mounting location and preferences. Thank you jfisch for finding the Harley Vault. I looked at the "Harley Vault" that sets inside the Harley, hard case, bags and it would be great if I hadn't already have almost new leather saddle bags. It's possible I could fit the vault in the leather bags and make it more solid than the cable. With the solid mount it would be opened easier with one hand and less likely to cut the cable and run. I guess a guy might be able to start making safes for bikes with different hardware to fit any bike. There are a lot of bikers with ccw or LEOs may be interested. Looks like the market might be there? Any ideas on options to attach & conceal a baton? Can you recommend a reliable baton? I have a VTX and I hide it were the tools should go and added a lock. I have a VTX, can you tell me how to lock it. I was thinking about the vest/jacket but myself. I used the flexweave cable from REI thru the trigger guard and then lock the box with a luggage lock. Just drill a hole through both sides of the box. I have luggage on my bike with zippers that have metal loops to attach a TSA approved cable lock through them. I lock anything valuable in these bags with these locks. As you mentioned, the criminal is looking to steal something quickly... IMO these locks offer the deterrent necessary. If they've got tools and your saddlebags are soft (not hard plastic) then anyone with a knife can take what's in it. You're sentry safe with a cable is a great idea too. i'd say that if you took it apart, and locked the barrel with a bike-lock/cable and took the slide with you, you'd be showing enough regard for the law to not get prosecuted. Easier to hide it that way, too, on your person and on the bike.